Think of softly faded reds and greens of holidays past and you've got an image of this necklace. The necklace is created with vintage and contemporary lucite and vintage enamel pieces. Each drop has been stacked and hand wrapped. Antiqued brass findings tie it all together. The softly muted shades of burgundy and olive are a stunning combination. The pieces of vintage jewelry that I've used make this piece truly unique. 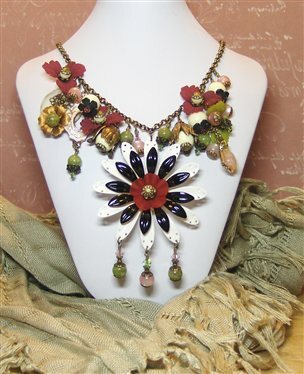 The necklace measures 19" and closes with an antiqued brass hook clasp.